Dexter was our Jack Russell/Dachshund mix dog. The best of both breeds, Dexter was a crazy dog who could be very active. He would race through the house running in large circles until he couldn’t run anymore. And small as he was, he was ready to face any foe whether it was the mailman or a rottweiler. But there were times when I wished he would just settle down. I’d try to tell him to settle down but soon I’d be screaming at him and he’d be running around even more. Or I’d end up chasing him which only encouraged further excitement. In the end, I discovered a simple solution; throw a blanket over him. No matter how excited he was, if I could get a blanket over the top of him, he would settle right down. It was magic. 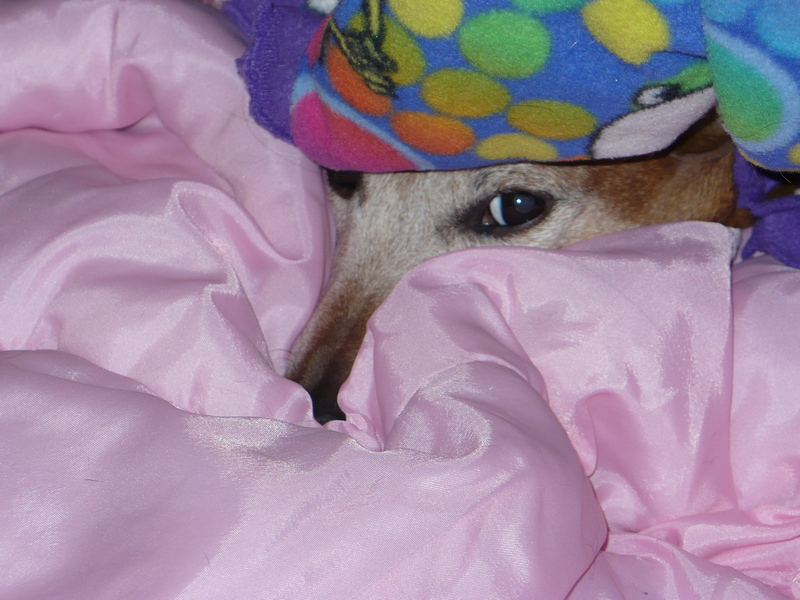 And he was so cute when he peeked out from under the blanket. How could I stay angry at a face like that?? We can often be quick to anger in our hectic world. The line at the grocery store is too long and we have places to be. The car ahead of us isn’t moving quick enough and the young woman at the concession stand isn’t getting our order fast enough. It’s easy to lose our cool and speak harshly. Recently, I found myself speaking harshly to a woman at my dentist’s office. We received a bill that was in error asking for a large amount of money. I didn’t have the money and I made sure she knew she was wrong. As I took a moment to hear myself speaking, I realized that I sounded awful. Taking a deep breath, I apologized and calmly stated my frustration. Her tone changed, my tone changed and we were able to figure out the problem together. Peter says that “most important of all, continue to show deep love for each other, for love covers a multitude of sins.” When I speak harshly and cast judgement, I’m not loving deeply. And by looking at others with love as our lens, it really does cover any number of sins. Learning to love deeply is a daily challenge that I continue to pursue. Because in the end loving God and loving others really is all I can do to make my world a better place. And like the blanket covering Dexter, bring peace to a chaotic situation. What makes you the most impatient? How can you love someone more deeply today? Have you been “nice” when you could’ve been “mean” before? What happened?